Unless you do something about the water, there’s an excellent chance that the pothole will come back in almost the same place quite soon or at least in a season or two. Mechanical Concrete® Pothole Terminator takes care of the water. Water usually comes from failed ditches, which causes water to stand on the road and eventually to go through the surface into the base. Water can also come from a poorly crowned road, which can cause standing water after rains or, even worse, ice in winter. Water can even come from underground springs or seepage. Gravity and freeze-thaw cycles help the water penetrate the surface. The base of a modern road is composed of graded stone; that means a collection of different size stones ranging in size from as big as your thumb or bigger to as fine as sand. The graded stone can be compacted together with heavy equipment and held together by the friction created between the particles. Such a compacted base becomes strong enough to support a semi-truck tire, or 100 psi. As long as it doesn’t get wet, a road base made in this manner can work for a very long time. But once the water gets in, it acts like a lubricant between the particles and removes their ability to stick together. So they slide apart a little with each passing truck tire—causing a rut or pothole. However, it is almost impossible to keep all the water out of the road base. So, to eliminate the pothole, the base must be held together by some other means. In most cases, on heavily traveled roads, this new means is a one directional curb and gutter, which partially confines the road base material and physically holds it in place horizontally along the curb. This almost always improves the performance of the pavement. But curbs do not eliminate potholes. There’s another technique which completely confines the base material and operates to hold the base stone together both horizontally along the center line of the road but also laterally across the road. This technology is the Mechanical Concrete® Pothole Terminator. Mechanical Concrete® Pothole Terminator holds and confines the road base stone inside a thin-walled, structural cylinder, which is made by removing both sidewalls from a waste auto tire. It uses one size stone, i.e., AASHTO #57s or similar, so it does not depend on friction between the stone particles for its strength. And, most importantly, its porous and its strength is not effected by the presence of water. It even works through freeze-thaw cycles or when it is completely submerged. This technology gives the road owner a new option for dealing with potholes, terminating them. Using Mechanical Concrete® Pothole Terminator, the pothole is completely excavated at the base as well as the asphalt surface is removed. The sub-grade at the bottom of the hole is covered with woven separation fabric. 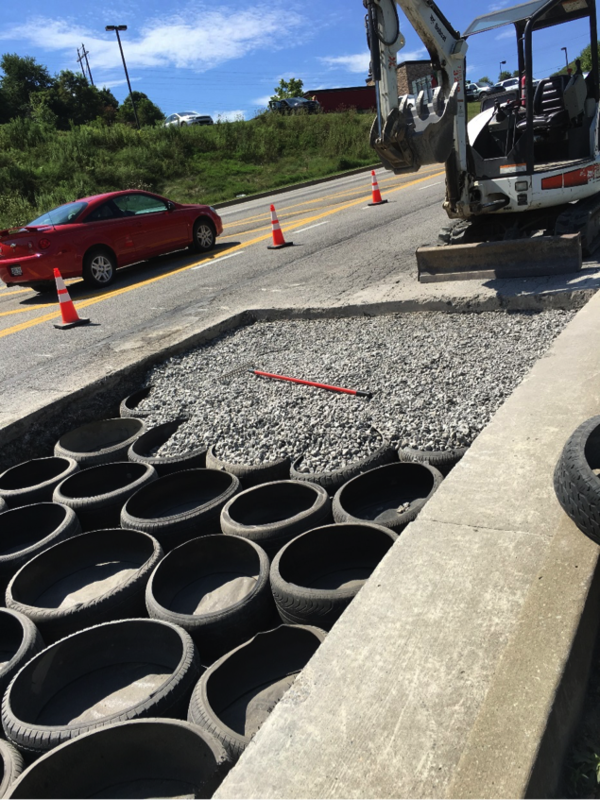 Then, a tire-derived-cylinder is placed in the hole and filled with AASHTO #57 stone, and new surface pavement is placed. This construction technique is known as the Mechanical Concrete® Pothole Terminator because it eliminates the impact of root cause of the pothole, water. It virtually eliminates the chance that a rut or pothole will form at that spot again. If you are a licensed road or excavation contractor or a MBE contractor, you can get a Mechanical Concrete® Pothole Terminator license. To learn more about this license opportunity, contact us!